Born April 3, 1785, in Charlton, Massachusetts, the son of a pious black­smith, Martin Ruter moved with his parents to Bradford, Vermont, in 1793 and later to Corinth. He received only modest schooling. Yet his spontaneous address to a camp meeting at the age of fifteen had such effect that he was invited to accompany an elder on a preaching cir­cuit. In due course he was licensed as a preacher. Primarily self-taught, he mas­tered five languages and was known as the most educat­ed man in the community of Methodism. In 1818 Ruter became principal of a Methodist academy in New Market, New Hampshire, the distant forerunner of Wesleyan University. At the Methodist General Conference of 1820 he proposed that each conference of the church have an educational institution within its precincts. This recommenda­tion sparked the beginning of a Methodist effort that had national impact. His success at New Market brought him ap­pointment as the book agent for the new Meth­odist Book Con­cern in Cin­cinnati. In eight years Ruter accelerated the church’s educa­tion­al activities in the West and began his noted volume on The Histo­ry of the Chris­tian Church. Other works by Ruter include A Sketch of Calvin’s Life and Doc­trine and A History of Martyrs. In 1822 the degree of Doctor of Divinity was conferred on him by Transylvania University. 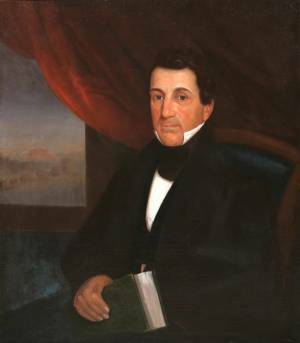 In 1825 Ruter became president of Augusta College, an institution he had helped to found. But he longed for the ministry and a congregation, so he went to the Smithfield Church in Pittsburgh in 1832. Small wonder then that he sighed when pressured by Pittsburgh Conference col­leagues to assume the presidency of Allegheny in 1833. He re­solved to stay only long enough for Alleghe­ny to ac­quire, as he said, “pros­perity and permanency sufficient to se­cure its usefulness.” During his first year in the post, Ruter petitioned the legislature in Harrisburg while Vice President Homer J. Clark ran the College. Ruter assumed on-site presidential duties only in June 1834. He moved into the east wing of Bentley Hall in spring 1835, the first pres­ident to reside where the president’s of­fice is now located. His salary was $700 per year. Ruter contin­ued to work on behalf of the church, preach­ing at camp meet­ings and serv­ing as pastor to a local congregation. On June 21, 1837, with the College seemingly reestablished, Ruter resigned to undertake evangelism in Texas. That winter he traveled the plains in weather fair and foul. For his founding of congre­gations he is termed the spiritual fa­ther of Texas. Exhausted, Ruter died of fever May 16, 1838. His body was first buried at Old Wa­shington, Texas, then at Ruters­ville, a town named for him in 1840. Rutersville College, predecessor to South­western University, was also founded there. In 1899 Ruter’s re­mains were relocated to Nava­sota, Texas. Martin Ruter had immense impact on the Method­ist cause in New England, the educational mission of the Methodist Church, and the reli­gious history of Texas. His stay at Alle­ghe­ny Col­lege was brief, but as with his other ventures, he was the right person active at a crucial time. Ruter Hall on the Allegheny campus, completed in 1854, stands a monument to his service and character.